"Multiple tools that keep you safe when chatting, shopping, banking and emailing"
In today´s world, there are many events we can take care of on the internet; for instance online banking, chatting, shopping, etc. That´s why if you don´t count on a reliable security system for your computer your privacy and data can be seriously compromised when surfing the web. 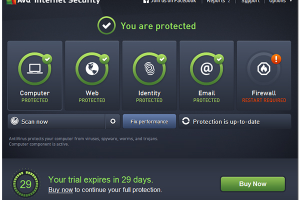 AVG Internet Security is the ideal suite to protect a computer. It provides users with various software applications which are essential at the time of performing online tasks. The best of all is that it always stays on alert, drastically reducing infection possibilities. The anti-virus and anti-spyware tools will assure safe PCs. The technology used by these tools prevents your computer from being infected by dangerous Trojans, viruses or worms. Not only that, but it can protect PCs from unauthorized access to private information by part of malicious adware and spyware. Your PC will also enjoy an anti-spam utility to keep emailing totally safe. What´s more, the optimized firewall will block malicious hackers before they can gain access to private files in your PC.